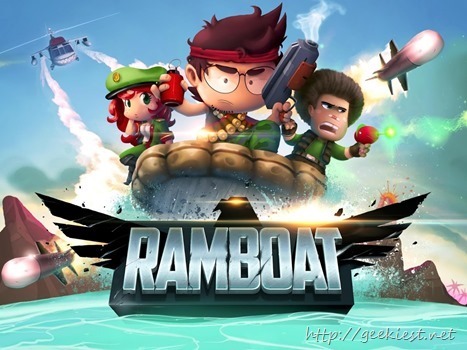 Ramboat is a famous iOS game which is available for Free. the game is now available for the Android users too. It is an arcade style shooting game where you can choose from 10 different crew member characters, 11 different boats and also different weapons like machine gun, rocket launcher, flamethrower, and classic pistol. You will be playing as the hero names Mambo (similar to the movie hero Rambo). You will have to drive your boat and escape from the enemy boats, bombs, missiles, war planes etc. to finish the objective. You can get bonus items while you shoot the enemies. 9 unique crew members- pirates, footballers, mafiosos, cyborgs, and even the mother of dragons! 11 powerful boats – race a luxury yacht, a submarine, a pirate ship… or a hippo! Sick weapons – try the machine gun, rocket launcher, flamethrower, or classic pistol! The game offers in App purchases, you can buy game currencies and using that you will be able to increase the progress speed. Free arcase style game for Android and iOS users.